As the new coordinator of the Robert and Elaine Stein Galleries, Michael Conlan has lofty ambitions for the galleries. He is no stranger to art and architecture. Michael Conlan has studied and practiced it in Boston, San Diego, Oregon and his native North Dakota. 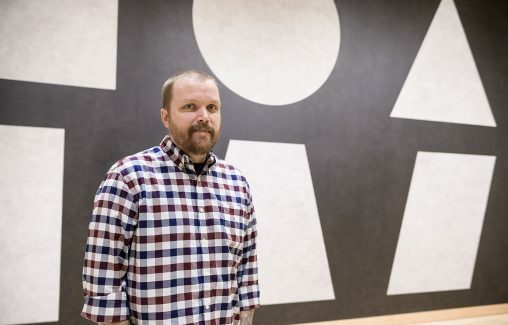 So when he arrived at Wright State University last fall as the new coordinator of the university’s art galleries, he knew exactly what he was doing. As he sits in the Stein Gallery, one of six in the Creative Arts Center, Conlan points to paintings and sketches by Renoir, Gauguin and Chagall. Conlan grew up in Williston, a prairie town in remote northwestern North Dakota, a 12-hour drive from both Minneapolis and Denver. Williston was the regional epicenter of oil exploration in the late 2000s, with workers flocking to the oil fields to chase their fortunes and changing the culture and the landscape of the area. Conlan’s boyhood and artistic perspective were shaped both by the stark natural beauty of his surroundings and its transformation into a sharply contrasting industrial tableau. So after graduating from Williston High School, Conlan left for Boston to study at the Boston Architectural College, New England’s largest private college of spatial design. During that time, he got a job working for the renowned architectural firm of Shepley Bulfinch Richardson and Abbott. His first project was designing the exterior façade for a new museum at Rollins College in Winter Park, Florida. In 2002, he moved to San Diego, where he and his wife lived in an artist loft and he mostly worked as an architect designing strip malls. Four years later, the couple moved to Portland, Oregon, where Conlan first worked as a draftsman for an architectural firm and later enrolled at Portland State University to study sculpture. He also took photography courses to learn how to document his sculptures, and in 2011 he graduated with a bachelor’s degree in sculpture, with a minor in photography. Michael Conlan described as “one of a kind” an instillation by Sol LeWitt, regarded as a founder of both Minimal and Conceptual art, in the Stein Galleries. Then the couple moved to Grand Forks, North Dakota, where Conlan attended the University of North Dakota and studied mixed media, blending sculpture with photography to express the ideas of landscape and place. “The transition from the very pastoral landscape I grew up with to the very industrial landscape that it turned into because of the oil exploration helped fuel my work as well as the ideas and process,” he said. While he was at the university, Conlan ran the school’s art gallery and helped manage its collections. After earning his master’s degree in 2014, he landed a job at the University of Dayton running that school’s art galleries. 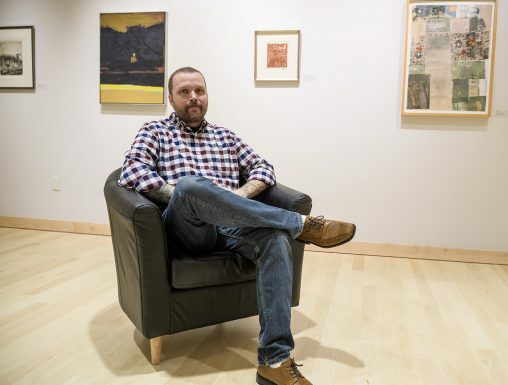 Conlan arrived at Wright State in November, attracted and dazzled by the university’s newly renovated Creative Arts Center and the collections in the Robert and Elaine Stein Galleries, which occupy two floors and about 7,000 square feet of the building. In addition to paintings and sketches by Renoir, Gauguin and Chagall, there are those of Lichtenstein, Rauschenberg and Rothko. There are whole suites of Andy Warhol photographs and prints. And an entire wall is devoted to Sol LeWitt, regarded as a founder of both Minimal and Conceptual art. Conlan said most of the collections in the galleries are modern and post-modern contemporary art. Other works, such as those of Renoir and Gauguin, are not the artists’ signature pieces. “But they are certainly signature artists. They are names that people will recognize,” he said. Conlan has lofty ambitions for the galleries. He wants to raise their profile in the community, bring in artists and their works, host multiple exhibitions and build the collections. “We are in the process of developing new programming that will engage the public and expose what the Robert and Elaine Stein Galleries have to offer Wright State University and the greater Dayton community,” he said.